1. In a medium bowl, stir together pecans, graham cracker crumbs, brown sugar and salt until well combined. Add maple syrup, bourbon, vanilla and water stirring thoroughly. Make sure the mixture becomes fully incorporated. 2. Form mixture into walnut-sized balls, then place on a cookie sheet and freeze for 2 hours. 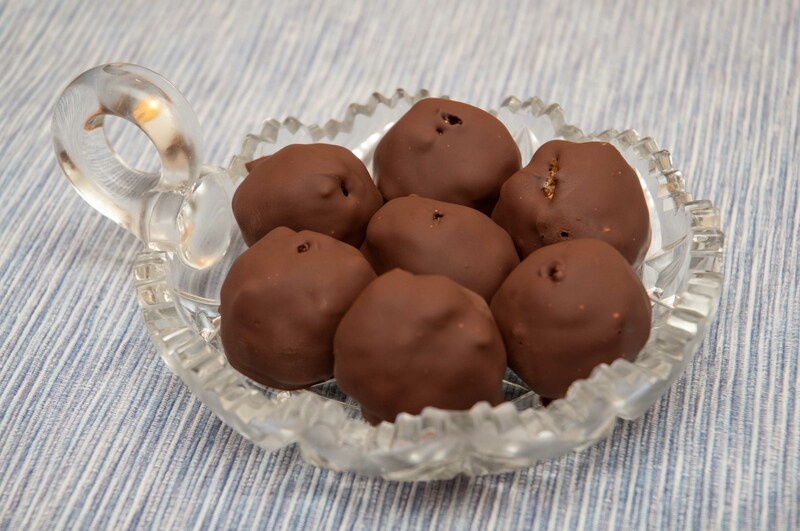 (I use a tablespoon measuring spoon to ensure consistency; yields 19 truffles using a tablespoon). 3. In the top of a double boiler or in a medium stainless steel bowl set over a pot of gently simmering water, melt chocolate. Line a baking sheet with parchment paper. Dip the frozen balls into the melted chocolate, then place onto prepared baking sheet. Let sit for 15 minutes or until firm.